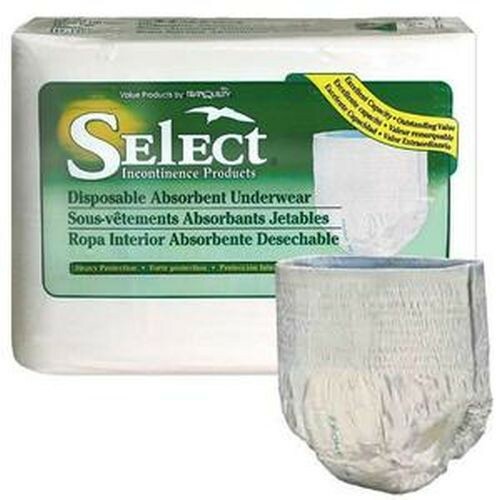 Select Youth Disposable Absorbent Underwear is a strong and comfortable youth-sized absorbent underwear that is designed to help make the transition from child size to adult size underwear much easier. They boast all the same great features you love about the adult size Select products, now at a smaller size that will accommodate that special in-between size. The Select Youth Disposable Absorbent Underwear feature a cloth-like outer material that is rustle-free and discreet under clothing, stretchy, and breathable for fit and comfort. The tear-away side seams offer easy removal, while the helpful blue waistband allows the user to distinguish the back of the brief from the front. Vitality Medical also carries other items that would pair well with the Select Youth Disposable Absorbent Underwear, such as Regular Disposable Underpad by McKesson and Aloe Vesta Skin Cleanser by ConvaTec. In-Between Sizing Perfectly Bridges the Gap From Children's to Adult Sizes. Cloth-Like Outer Material Is Rustle-Free Under Clothing, Stretchy and Breathable For Fit and Comfort. Gentle Waist and Leg Elastics Hold Securely Without Binding. Kufguards Inner Leg Cuffs Protect Against Leakage and Bowel Containment. Blue Waistband Indicates Back of Garment. Tear-Away Side Seams For Quick and Easy Removal. Size: 15"-25" Waist / Hips, 38-65 lbs.